Luxury is dichotomous, conflicted and conflict-creating by its very nature. “Luxuria” is Latin for “Lust”, the first in the list of the Seven Deadly Sins. The British poet Edith Sitwell is quoted as saying, “Good taste is the worst vice ever invented.” Luxuries are not a basic fundamental need to start with, yet to seek them out is innate in our nature. For the most part, the term luxury has been and continues to be applied to tangible goods whether found naturally, hunted or manufactured, rather than to intangible services. Yet, it is the intangible that differentiates what is luxurious from what is not. Certainly, the definition of luxury changes with time. There was a time, in today’s advanced markets, when hot water baths were a luxury and available frequently to only a few people. Indian pepper was once more expensive than gold. In fact, a significant part of European exploration of the world during the last millennium was driven by the craze for spices from “the Indies” before morphing into empire-building. Today, most modern Europeans would call neither a hot bath nor spices as a luxury, and many would gladly delegate to someone else their share of global travel. If we want to understand the shifts in the luxury market and how the emerging markets of luxury such as India and China might evolve in future, we must understand the two most fundamental drivers of price premium: the social esteem achieved and the possessor’s own experience of the product or service. 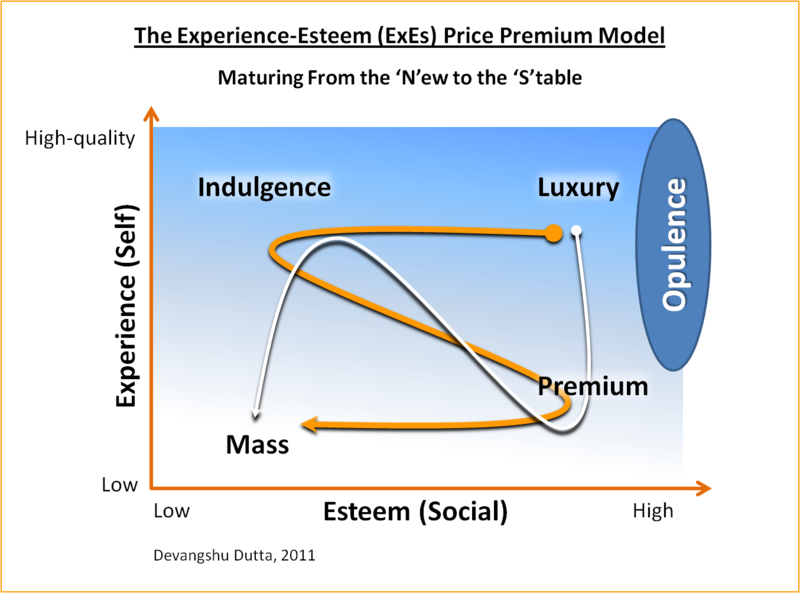 When viewed together in the Experience-Esteem Price Premium Model (see graphic), we see the relationship of price premium and these two factors zig-zagging in an N-shape for immature or rapidly evolving markets (“New”), whereas in more mature markets the premium would follow more of an S-curve (“Stable”). The term “market” here refers to not just geography but consumer segments, including segments defined by need/use rather than by demographics such as income or age. In rapidly evolving markets there is a significant premium available on products and services that are conspicuously expensive, whose price (or at least the apparent price level) is known in the buyer’s social circle. It’s a positive feedback loop: high social recognition keeps the price up, which in turn improves the social esteem of the buyer. Expensive cars and gadgets, designer brand apparel and accessories, holidays that would be the envy of others, Big Fat Indian Weddings (for and by Indians) all fit into this category. Beyond social recognition, however, the buyer’s own experience and satisfaction also plays a role in driving the price premium: the better the buyer’s own experience is for a given amount of social recognition, the higher the price premium is likely to be. This gives rise to the familiar pyramid for the luxury market, where the highest price is available for products and services that deliver both high social status and a superlative personal experience. In “New” or evolving markets, more of the premium is attributable to social status; the buyer’s thought process is: “if you’ve spent a million Rupees or Yuan on something and no one knows about it, it’s not that valuable”. In more evolved or “Stable” markets, on the other hand, where tastes have had longer to evolve, personal experience becomes important in driving premium for at least some products: for example, high-fidelity unbranded speakers bought by music aficionados or a vacation in an unknown destination fit the bill. The satisfaction, and the premium, is driven more from the personal high-quality experience, not from receiving recognition or respect from someone else. Developing taste needs time both at the personal level and for the society. On the other hand, status difference is a factor in all societies, at any given time. The pull between conspicuous and inconspicuous consumption at the higher price end plays out between indulgence and luxury versus opulence. Opulence may or may not enhance the buyer’s experience, but its main function is to make a status-statement, including instances such as millions being spent on “public” spaces to enhance a political leader’s own standing. The thing with status is this: If others see you as worse off than them it is their problem; if you think you’re worse off than others, it is yours. By and large, the luxury industry, as it has evolved over the last 30-40 years, feeds on this status insecurity that is multiplied and amplified by media. Luxury used to mean something that was expensive because it was highly desirable but also scarce. Today ubiquity seems to be the driving force of luxury not scarcity. As economic growth has created nouveau riche worldwide, brands (especially logo-bearing ones) have emerged to deliver instant gratification and legitimacy. Distinct, recognisably expensive brands are the accepted currency in the world of cachet. In the final price, the share of marketing spend is often higher than the cost of the core product. In a consumer society that is more conscious of the status that the product offers rather than its utility, it is the recognition and identification that matters most. This has led to the trickle-down effect with luxury brands becoming increasingly more accessible, not just in terms of physical availability but also in terms of price units through bridge, diffusion and prêt lines, and licensing. A particular consumer may not be able to buy a Chanel dress or Dior gown, but she can surely scrounge enough to buy a perfume that promises at least a whiff of celebrity status! The vintage of the product or service is an important component of the status or recognition premium, especially when the buyer has newly come into money. 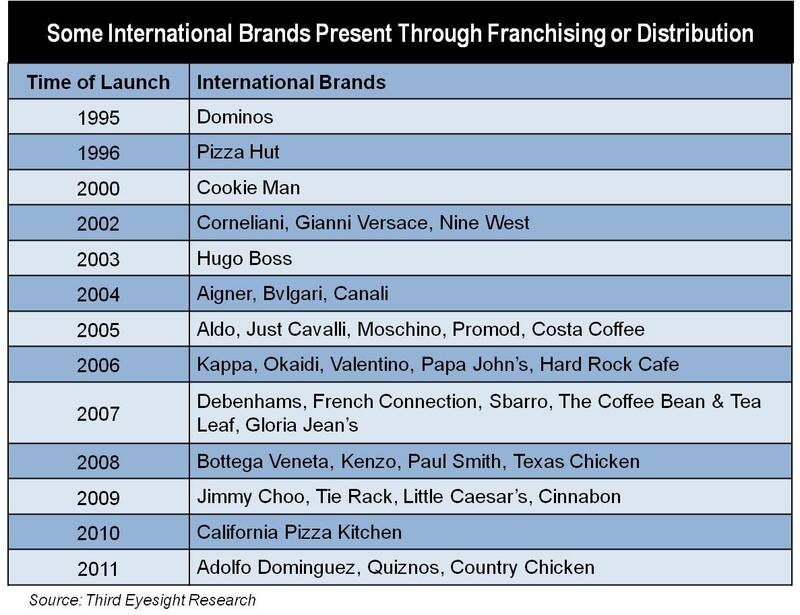 This is why the market is dominated by European luxury brands that can claim ancestry of at least a few decades, if not centuries, while there are barely any brands of note from other geographies. This is not conclusive evidence of European tastes being better or more acceptable, just the economic cycles through which societies around the world have been. So where does India stand for luxury marketers? The Indian operations of most brands that have been launched in the last few years are bleeding, and seem unsustainable. And yet, it is tempting to compare the emerging golden bird of India to the golden dragon of China. In our work with brands and marketers from around the world, we have to constantly remind people that not all emerging markets are the same. The explosion of luxury and premium brands in China during the last decade or so has been aided by sudden economic growth that came after a long cultural and economic vacuum. When the new money wanted links with the old and when uniform grey-blue suits needed to give way to something more expressive, well-established western premium and luxury brands provided the most convenient bridge. As China evolves further and consumer become more discerning, I believe we will see the emergence of Chinese and smaller new international brands that differentiate themselves on the core product, rather than relying on a long foreign history. India’s case is slightly different. Discernment may be a new experience to some Indians who have come into money recently, for whom brands can be a valuable guide and “secure” purchase. Globally well-known premium and luxury brands or products that are endorsed by “people in the know” (including works of art) are the first to benefit from this spending. However, discernment and taste are not new to India and, more importantly, differentiation and self-expression never disappeared even during the darkest years of “socialistic” economics. Therefore, India will see a layered approach to the luxury market and grow in a more fragmented manner, with slower expansion of individual brands. There would be multiple tiers of growth for international as well as Indian luxury products. For international brands customisation and Indianisation will be important, as is already visible in bespoke products by Louis Vuitton and Indian products by brands such as Canali (jackets) and Lladro. And there is a real prospect of luxury Indian brands emerging to respectable size, if they can stay the course and travel the distance. As the market matures spending by Indian consumers on indulgences will also grow, driven by the need to satisfy themselves rather than for the status they could gain. In fact, another market to watch out for is India itself is a source of indulgences for foreigners – luxurious Indian experiences in which price is not the object but the experience – Big Fat Indian Weddings, ayurvedic treatments and meditation holidays for non-Indians are a case in point. While on indulgences, in closing, I refer back to the ExEs Price Premium Model. For a limited number of people the price premium curve follows a clockwise-D, starting from Indulgences. For them invisible or inconspicuous products whose only function is to enhance the owner’s or buyer’s own experience are the most prized. In many cases, the fewer people that know about it, the better and more premium it would be. In fact, perhaps invisibility could be the greatest indulgence of all in a world of hyper-information, self-promotion and instant celebrity. Increasingly we will find that anonymity and invisibility will be treated as luxuries, and service providers will charge a huge premium for taking you down below the radar, making you invisible. We don’t really need to wait to see that emerge. That world of luxurious anonymity is already here, and its most valuable service providers are banks in offshore tax havens! India is one of the largest markets that promises a sustained consumer-led growth in the foreseeable future, due to the shift from a fragmented retail ecosystem to a more modern and consolidated industry. Modernisation and consolidation will happen not only in front-end (retail) operations, but also in the supply chain of both products as well as tertiary suppliers such as equipment and service providers. Well-informed investors are looking at the entire ecosystem rather than only funding the front-end of the retail business. The biggest challenge for private equity and venture funds looking to invest in the Indian retail sector is finding business models that are logically scalable within a four-to-five years time frame and allow the investor a decent exit. Due to the nature of the most funds and how they are structured, a seven-to-eight year term is the maximum time a fund would be involved with an investee company and it is difficult to find an investor with a longer-term horizon. On the other side, this can also prove to be a challenge for the investee company: some of them may feel unduly pressured to grow faster than the natural pace of their business and could make strategic and operational decisions that are destructive to the business. As consumer incomes move up and the environment becomes more conducive, the life cycle to building a retail business becomes shorter. For instance, 20 years ago it would have taken over 10 years for a business to cross Rs. 100 crore (INR 1 billion). Today, with the right mix, it would take much less time. However, building a business that is both large and profitable (hence sustainable) still takes a significant amount of time. 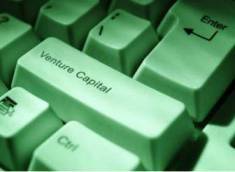 Venture equity is suitable for businesses that can grow and add value inorganically, either in intellectual property-driven businesses such as technology companies and brands that can provide higher margin returns on a given equity base, or by selling the business further to investors who think they can derive even more value from it in future. Retailing, on the other hand, is inherently an organic growth business, and the most suitable sources of funding for organically grown business are internal accruals and debt. However, the rapid economic growth in the last 15 years has created an opportunity for large businesses to emerge inorganically. Good examples of this are the large corporate groups that have entered retailing. Looking at them, one could be seduced into thinking that the environment and the business have changed significantly such that other professionally created businesses could be easily launched, venture-funded, and grown to exit. My take on this: If you can create a fund whose life is 20 years or more rather than the typical 10 years, there is a better likelihood of making it work. Of course, bank debt is not easy for an entrepreneur either – Indian banks have become more progressive, but the norms are still relatively stringent. Unless the space is bought, the retail business has few significant-value fixed assets, and bank loans are limited for businesses that cannot offer much collateral. Each stage of the retailer’s growth needs a judicious mix between own capital, supplier credit, bank loans and external investors’ equity. The last one evolves from friends and family at the inception, to angel and venture investment during growth to, eventually, public equity, if all goes well. Each of these sources of funding come with their own expectations on returns and disclosure, so an entrepreneur needs to balance these based on his own comfort levels. One of the most important characteristics for most institutional investors is that the business seeking funding should have a broad and deep management and executive team, rather than being over-dependent on the founder-entrepreneurs. There needs to be a demonstrated track record of growth that has been delivered by this team, and a clear future direction to sustain and grow the business. It is a curious cycle: structured, process-oriented and systematic businesses that are not dependent on one person (the founder) are more likely to attract outside money, and outside money coming in puts more pressure to create transparency and broadening responsibility with which many entrepreneurs are uncomfortable. Most of them start their own businesses so that they do not have to report to someone else, but the moment there is external money involved, you realise that you are answerable to someone else. This is often a tough call for an entrepreneur – not just in India, but worldwide – a traditional, patriarchal and feudal mind set will just not work with external investors involved, especially in today’s environment where information and opinions flow more freely than ever before. One of the most common mistakes Indian retailers make while trying to get funding is over-estimating the market demand. The second is underestimating the complexity (and costs) involved in starting and growing the business to profitability. Once you have put a business plan out there, it not only becomes a hook for your prestige, but valuation norms are also driven by the figures that have been agreed upon. This can cause business decisions that look productive in the short term – such as adding stores to grow sales immediately – but are harmful in the long run, such as adding stores in locations that are not sustainable. We have seen such decisions being made in the last five to six years, and investors as well as bankers are more wary today while evaluating businesses to fund. A key thing to remember is: no matter how badly you want the money, it is not just about the money. From an entrepreneur’s perspective, who provides the money can be even more important than how much and how quickly the money comes in. For example, a particular investor could bring in a business perspective and relationships that are directly relevant to the entrepreneur’s business, which can add value well beyond the money that flows in. Commonality of objectives and a shared view of the time frames involved are also important, so that business decisions have the full support of the investor. Timing is important: If you get an investor in too early, you may be losing on the valuation and selling out too much of the business to one investor. However, holding out for the ‘ideal’ benchmark valuation is possibly worse, because there is also a cost to the time and opportunity lost in getting the required funds. If I were to focus on one piece of advice to an entrepreneur looking to raise funding from a VC, it would be this: don’t try to extract what you think is your complete lifetime’s worth from the first investor deal that you sign. If the business is successful, and the first investors are happy with their returns, they and others are likely to come back to you in far greater numbers, offering much higher valuations. Later-stage retailers still have avenues to raise debt and private and public equity, whereas start-ups and early stage businesses that can add significant entrepreneurial colour into the business are the ones that are struggling to get funded. In many countries early stage seed, angel and venture investments are provided incentives in terms of tax structures – this is something that the venture community in India has been lobbying for with the government, and if provided, could improve the ‘investibility’ of early stage retail businesses.